This year Réserve Royale has been once again the beer partner of Dinner in the Sky Belgium. Dinner in the Sky is a Belgian concept that Forbes magazine called one of the world’s ten most unusual restaurants. Indeed, it is nothing less than 22 guests, 1 Michelin Star chef and a table lifted by a crane at 60m in the air. This year, 3 tables were lifted simultaneously. After a world tour (Sydney, Toronto, Rio, Monaco, Paris,…) accompanied by the best chefs on the planet ( Joel Robuchon – page officielle-, Pierre Gagnaire, Alain Passard, …). 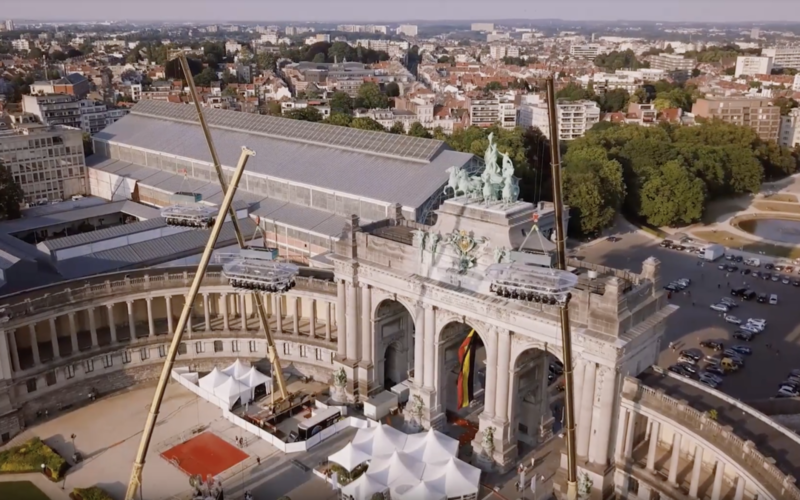 Dinner in the Sky has taken over the sky of Brussels for its 11th time. Each day the chefs have treated 22 guests to a 5 courses lunch and 2 5 courses dinners. The event has taken place from the 8th to the 17th of June 2017 at the ‘Cinquantenaire’, Brussels.